The model U pistol appears to be the 7.65 mm Parabellum (.30 Luger caliber) version of the A/B series of 1911-inspired pistols that led Star design for the next 60 years. See the models A, B, P and M for more details, and manuals for this series of pistols. This seems to be of the larger (P and M) size. It is apparently very rare, as I have never even heard of one except the one shown here. Even the multi-model manuals make no reference to it in their applicable-models list. The few reports that have previously claimed it exists say it was developed as a possible Italian market version only, and that there may only be very few, possibly only prototypes or pre-production samples. Italy, like a number of countries, limits civilian ownership of firearms to those that are "non-military" cartridges. This is usually interpreted very narrowly to mean "cartridges currently used by the armed forces of our country." Therefore, it's easy to get foreign and old surplus guns, and ammunition. 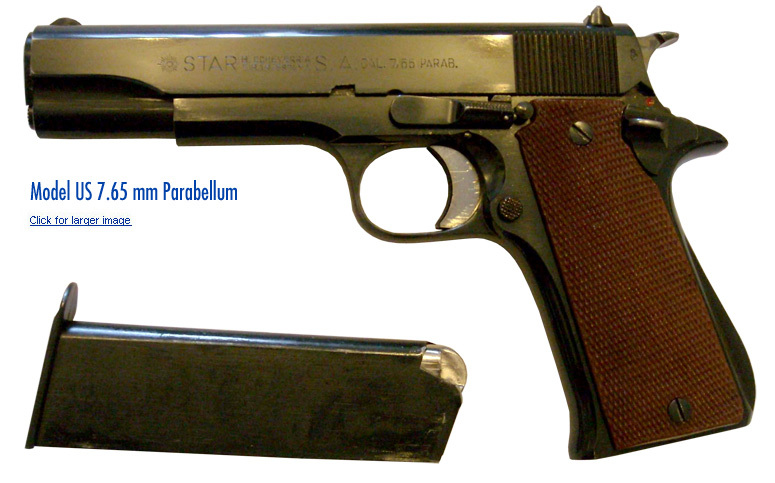 The 9mm has always been restricted in Italy, making 9x21 a current favorite to replace it, but perhaps in the 1970s some importer in Italy or marketing guy at Star thought 7.65mm Parabellum would sell in place of 9 mm Parabellum. One chart lists the model US as starting production in 1972, with no end date, and also a model UKS, which would presumably be like the BKS, a short, alloy-framed pistol. The pistol pictured appears to match this information, a non-super variant, with styling, finish, stocks and markings of the 1970s, and features of the drop-safety improved S series pistols. The owner of this particular pistol is Italian, and the pistol is proof-dated 1972, which matches the little information published. There was a box, with a prontd Mo. (model) US label, indicating that at least several hundred were produced, or that large scale production was committed to even if never executed.